Gain recognition for your California Employment Law expertise! If you are a people manager, human resource professional or conduct business in California, this micro-credential provides you complete competence in the complex legislation that affects California business. 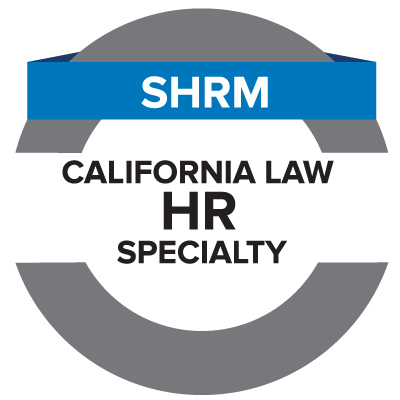 You can now earn a SHRM California Employment Law Micro-Credential through CalSHRM to demonstrate your California employment law expertise. Enrollment in California HR: Applying CA Law to Employment Practices, a two-day classroom instructional course, or 8-session virtual course led by qualified, SHRM-SCP certified instructors. 51-question online California knowledge assessment, distributed to you by SHRM. Upon passing the assessment, you may add your Micro-Credential "digital badge" (pictured above) to your resume, e-mail signatures and social media profiles, proving your California expertise to your employer and your network. People managers, human resource professionals, business owners, legislators, or any persons seeking in-depth knowledge of California employment law and labor codes. The SHRM California Employment Law Micro-Credential is considered a SHRM Specialty Credential, which recognizes accomplished competency-based professional development in a focused field of practice. Those completing a SHRM Specialty Credential have demonstrated an expert level of knowledge in a complex and continually-evolving topic area. Once earned, practitioners will receive a certificate of accomplishment along with a digital badge verifying their expertise. In addition, SHRM-CP or SHRM-SCP credential-holders who complete a SHRM Specialty Credential will have the designated set of professional development credits (PDCs) allotted to the specialty credential automatically uploaded to their SHRM Certification Portal. A SHRM Specialty Credential will remain valid for three years from the date of completion. A SHRM Specialty Credential cannot be recertified and can only be re-issued following completion of the updated specialty credential learning program. We offer several options to take the California HR course that is part of the SHRM California Employment law Micro-Credential program during 2019. Select the option that best suits you. Our in-person 2-day courses run 8:30 AM-5 PM each day for a total of 15 hours for the two days. Breakfast and lunch are included. Our live online course has 8 sessions, Tuesday and Thursday evenings, 5:30 PM - 7:30 PM each day for a total of 16 hours for the 8 sessions over 4 weeks.